"Star Wars" on Blu-Ray: Disc #5 - "The Empire Strikes Back" - I’ve just made a deal that will keep the empire out of this Blu-Ray disc forever! As explained in this post, I’m reviewing the Star Wars Blu-Ray set disc-by-disc; today, we discuss the best film in the series by analyzing the contents of Disc #5, which contains Episode V: The Empire Strikes Back (I’ve just made a deal that will keep the empire out of this Blu-Ray disc forever…). I’ll review the film itself, discuss the video and audio quality, extras, and more, a trend which will continue throughout the week as we continue through each disc in the set. The Film: Well what have we here? How does one make a satisfying sequel to a film that is, by most standards, perfect? That’s the challenge George Lucas, Irvin Kirshner, Lawrence Kasdan, and the rest of the Star Wars cast and crew were faced with when making “The Empire Strikes Back,” and their legendary response to this challenge has since set the standard by which all blockbuster sequels are judged. 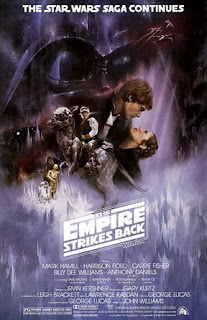 “The Empire Strikes Back” continues Lucas’ space opera in splendid fashion while throwing the pacing, structure, and tone of its predecessor out the window. While “A New Hope” built up to big battle scenes and action beats, “Empire” instead opens with its largest set piece, and from there splits up the characters across the galaxy; in what was certainly a shocking move at the time, the film then takes on a much more measured pace, spending as much time on Luke’s training and Yoda’s philosophy as on Han Solo’s thrilling attempts to keep the Millennium Falcon and its passengers out of danger. Tonally, the film is far darker and more introspective; instead of repeating the triumphant ending of its predecessor, the Empire wins this round without difficulty. That’s where the brilliance of “Empire Strikes Back” lies, of course; in the last act, Luke, Han, and Leia all face their darkest hours, but it’s within these terrible moments that they all learn the valuable lessons they’ll need in order to stand a chance against the evil of the Empire. Luke’s confrontation with Vader humbles him and demonstrates the validity of Yoda’s teaching, Han learns the meaning of selflessness when finally confronted with a situation he can’t run away from, and Leia’s leadership skills are put to the test time and time again as her icy exterior begins to melt away. First and foremost, “Empire Strikes Back” is a character study. We’ve already been on a grand adventure with these heroes, so why try to replicate that formula? The film is full of action, don’t get me wrong, but once our heroes leave Hoth, the set pieces are more focused on character drama; the action functions like the songs in musicals, moments where the characters open up in way they couldn’t under normal circumstances. Of course, “Empire” is as apocalyptic as it is introspective, establishing the standard many blockbusters would later follow of going darker and deeper for the second installment. In 1980, the film was criticized for this decision; today, it is considered not only the best Star Wars film, but one of the all-time great movies for those exact same creative decisions. Not only is that a masterfully written speech, the rare bit of Star Wars dialogue that stands on its own as gorgeous, flowing prose (Yoda’s dialogue in the prequels isn’t nearly as nuanced or precise, for instance), but I truly believe that Yoda’s delivery of this speech is the best bit of acting you’ll find in the entire Star Wars saga. That a puppet could deliver such a powerful moment is mind-boggling. With the possible exception of Gollum in Lord of the Rings, no CGI creature has ever come close to rivaling what Frank Oz and his team pulled off with Yoda. But when all is said and done, Yoda is just one perfectly executed element in a film full of groundbreaking accomplishments. The original “Star Wars” was perfect. “The Empire Strikes Back,” is far darker, more introspective, and ultimately, even better. It’s such a rich bit of filmmaking that after 1000 words I haven’t even touched upon the most iconic bit, the startling “I am your father” revelation. Then again, I probably don’t need to; if you’ve seen “Empire,” you know why it’s brilliant, and if you haven’t, words can’t do it justice. It must be seen to be believed, and luckily, this Blu-Ray is the best way to experience the film. Yet on the whole, “The Empire Strikes Back” still looks fantastic, and seeing this classic in high-definition is just as big a revelation as “A New Hope” was. Much of what I wrote about “Episode IV” still applies here; the film’s original grain structure is left in tact, and there appears to be very little digital tampering on display (apart from certain special edition changes, of course, of which there are very few). Once again, this is an extraordinarily film-like image; warm, deep, and full of rich colors. Fans may remember that on the 2004 DVD, the color timing for “Empire” was off, and the entire film had a subtle but noticeable blue tint; that appears to have been mostly rectified this time out (although Darth Vader’s lightsaber still errs on the side of pink when it should be hot red), and we instead get very organic, natural, and vibrant colors, along with terrific contrast, something particularly important in this visually dark entry. Even though there are softer scenes every once in a while, the staggering clarity is still the main attraction here, and trust me when I say you’ll discover plenty of background details you never knew existed. Dagobah is particularly revelatory in high-definition; I’ve seen many documentaries on the making of this film, so I know Dagobah is just a soundstage in England, but damn if it doesn’t look 100% real here, more believable than it ever has before. That speaks both to the quality of the transfer and the brilliant craftsman who built the set so many years ago. Even more impressive is Yoda; you would think that, in high definition, we might see some sort of flaws in the puppetry, but the opposite is true: HD exposes the true brilliance of this performance, and I had to continually scrape my jaw off the floor while looking at the extraordinary levels of nuance found in Yoda’s face. But as far as demo-worthy scenes go, nothing can quite beat the opening Hoth material, an already mesmerizing set piece made even more exciting in HD. This Blu-Ray presentation of the film is a wondrous testament to the work of the artists who brought this film to life; suffice it to say, the results of their labor have never looked better. Unlike “A New Hope,” the sound editors at Lucasfilm didn’t have to rebuild “The Empire Strikes Back” mix from the ground up; it still took quite a bit of work to prepare the film for DTS-HD 6.1 audio, but many of the elements were already in place, so the work wasn’t quite as exhaustive. Perhaps unsurprisingly, the results aren’t quite as spectacular as the “New Hope” mix, but make no mistake: this is still a flawless soundtrack, easily on par with the sound for the Prequels. It’s immersive, wonderfully balanced, and crystal clear from start to finish. “Empire” is a film with lots of flying and many rousing space battles, and in HD audio, these sound effects have a good shot of knocking the viewer out of their seat. But the mix tackles ambiance just as well; sound adds so many layers to the atmosphere of Dagobah, or the icy climate of Hoth. And of course, the Imperial March has never had this much of a sonic impact. It’s not the be-all, end-all mix found on “A New Hope,” but it’s still one of the best I’ve ever heard. All the discs in the set feature identical menus and presentation – the only differences are the choice of clips and music played (appropriately, it’s the Imperial March this time). As previously explained, the menus are unexciting but very efficient. Once more, we are given two commentaries, the original, traditional commentary from the 2004 DVD set, and a new commentary cobbled together from archival interviews and sound-bites. I’ve enjoyed all of the original commentaries so far, but the one for “Empire” is easily the best because director Irvin Kirshner joins George Lucas and Ben Burtt for the discussion. Kirshner is a lively and extremely thoughtful presence, and I always love hearing him talk about his contributions to the series. His energy goes great alongside Ben Burtt’s, and balances out Lucas’ slower, more laid-back speaking style. As always, however, the archival commentary is the more fascinating listen; as with the “New Hope” commentary, whoever put this thing together did a wonderful job, finding fun and informative anecdotes from nearly everyone involved with the movie, and the myriad of voices and perspectives keeps this track engaging from start to finish. One movie left…I would be sad, but once we finish “Return of the Jedi,” we finally get to move on to all the bonus features! Staying in the moment, though, I wonder how the CGI dance number at Jabba’s palace, “Jedi Rocks,” will look and sound in HD?